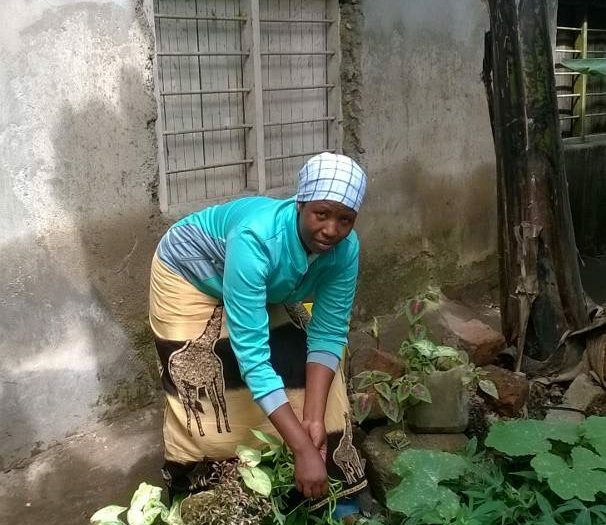 We join Rosemary, our local monitoring and liaison officer, on her visit to Kwa Iddi, a township not far from the hustle and bustle of Arusha, as she’s sees the impact our small grants and loans programme for women with HIV has had on recipients. If you missed Rosemary’s first blog on her visit, you can catch up here! We move on to meet Janeth Jacob who is at home. She rents a room near the main road where she lives with her two daughters. It is close to the hospital road and just the right place to sell roasted maize cobs. She hopes to sell between 50 and 70 cobs a day which she starts selling at 4pm, earlier when it is cold, and finishes around 9pm. Now we move away from the main road up a nearby track to visit Naiserian Elifasi who has built a small lean-to kiosk. She hopes to get enough income to support her daughter through school where she will study economics, maths and geography. It will be hard for Naiserian as her husband left her with a large family to support, but she is more fortunate than some as she lives in a large compound in a brick house which belongs to her husband’s family. 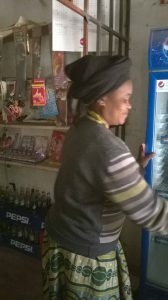 Faustina Mugowa has recently rented a shop. With a Mondo grant she put up shelving and started a Tigo Money account (a means of saving, transferring money and paying bills by mobile phone). She also sold soft drinks and a few other items. With the loan that she has just arranged with Mondo she has been able to expand her stock and because the Tigo money business was slow she has added an Mpesa (Vodacom) account to her business. The Mpesa account is bringing in a lot of business and she has built up a network of contacts who will lend her money for large transactions. As we sat and enjoyed a soft drink, two children came in to have photographs taken for school entry papers – another of her ventures. She has many ideas for the future and is happy to be able to support her three teenage children, one of whom is at university studying IT. We move on up a steep hill and meet Pendo who, unfortunately for us, is not working today. She is a Mama Lishe and we were ready for lunch!! Pendo started work by making chapattis for sale in the morning as people set off for work. From her original spot, she moved to a roadside area just opposite a big church and close to a row of shops. She started making chai (tea) and cooking chapatti, and by adding rice and beans she was able to serve breakfast and lunch. Now she has moved into a newly built banda (a covered area), white washed and clean, which she rents. Here she prepares chapatti and chai for breakfast and then moves on to a full menu of rice, beans, chips and kebabs available from 11am. She arrives at 6.30am and now works through to 9pm. Of course she needs a helper and together they are preparing the food either on charcoal in a corner of the banda or outside on a wood fire where the beans are cooked. Pendo has three children, the oldest of whom is 8 years old. They were at home today being supervised by a neighbour as Pendo is a single parent. Pendo rents her home but her dream is to have her own house and by feeding around 30 people a day she will slowly reach her goal. Neema William lives down a track and has a small roadside kiosk. For some years she had enough capital to sell a few vegetables and some charcoal. With her grant she was able to buy large sacks of mkaa (charcoal) and on her stall she has increased her stock to include a variety of vegetables, mandazi and bread. She is supporting 4 children and with her savings has been able to keep some sheep and three ducks. Neema is a busy woman. So many new people to meet and talk to but now it’s time to leave Justin and head back to the main road, having been inspired by the successes of these wonderful recipients!